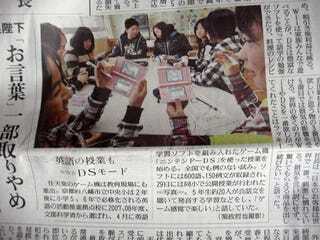 Elementary school students in Kyoto Prefecture's Yawata City are using the Nintendo DS to study English starting this April. The DS software will contain 600 words and 150 phrases. Can't wait until 2012 when it's announced that pre-schools in Yawata City are using the DS to learn English or 2016 when the city launches fetus DS English language study. Maybe that'll be in 2020. Hey, like we know.